Every chess player has heard about the importance of studying annotated games. We are often told it is an effective method of chess training. Of chess learning. Of chess improvement. Why should I study annotated chess games? How should I study annotated chess games? Which annotated games should I study? We will first try to debunk these questions. In the end, we will wrap things up with recommendations of annotated games that are well worth the study. WHY to Study Annotated Chess Gamrs? Annotated chess games improves your Pattern recognition. The most important benefit of studying annotated chess games is the familiarization with different patterns. From strategical principles and tactical operations to typical positional maneuvers – it is all about patterns. The ability to recognize patterns is a trait of a good chess player. Patterns are the foundation of an overall chess knowledge that determines a player’s calibre. Through annotated games, you absorb patterns. And you fill your chess armament with fresh ideas. The more patterns you know, the easier it will be to find them when they appear in your own games. You will spend less time in critical positions and less frequently ask the dreaded „What should I do now?“ question. At this point, another doubt arises. Couldn't we assimilate the patterns by simply going through games without annotations? Well, to an extent this is correct. It is important, however, to remember it is not all about memorizing patterns. In order to apply them efficiently, it is essential to know why and how they appear. Annotations simply add another dimension to the learning process. They help you understand the patterns more thoroughly. Annotated chess games improve your understanding of the game. In another article we have emphasized the importance of understanding what's happening in the context of chess engines. When you just go over the moves it is somewhat similar to working with a chess computer. It is a passive way of working on your chess. You shut your brain off and move the pieces, without stopping to think. Sure, you do get something out of it. But it is not the most effective method of chess training. Annotations, on the other hand, guide you through a game. The authors explain the reasoning and logic behind critical	moves. They explain the idea behind every move. They explain the thought process and strategical thinking of a top chess player. Think of an annotator as an invisible trainer. 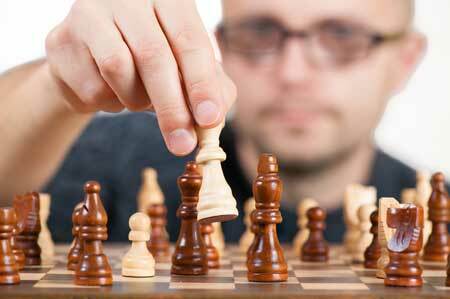 A good annotator is a strong chess player who also understands how to transfer his knowledge. And the amount of chess knowledge determines the class of a chess player. Understanding is important in all phases of the game. But there is one phase where it is absolutely crucial – the middlegame. 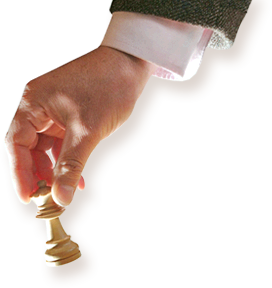 The middlegame is arguably the most difficult phase of the game to master. Partly this is because it is the most complex part of the game. But mostly, the real question is how should one approach its study. It is impossible to 'memorize' it or to learn it ‘by heart'. The middlegame is the phase of the game where understanding is crucial. Where a player with lack of understanding can easily drown in the sea of complications and possibilities. Going over annotated games is an important step in solving this daunting problem. The annotations break the complex problems arising in the middlegame in simpler components. They make the middlegame operations more comprehensible. Probably the only better method of improving your middle game is analyzing chess games on your own. But this task can often be a) time consuming and b) too advanced for beginners. Compare it to solving math problems. Books that guide you through every step of solving an equation are much more valuable than books that only give you the final solution. Sure, after a while you are expected to solve problems on your own. But when you are learning something for the first time, you need guidance. You need explanations. You need the annotations. Although it is possible to improve your openings by going over games without annotations, it is rarely the best approach. Annotated games are fantastic for the opening theory study. They deepen your understanding of the opening phase of the game. They make your opening play much more concrete and inspiring. More importantly, players below master level are able to punish opponents who play inferior moves more efficiently. Yes, memory is much more important in the opening phase of the game than in the middlegame. But too many players rely exclusively on it. They learn a certain line by heart. They go to the game. They get confronted by a 'novelty' from their opponent (often a weaker move) and they don't know what to do. They remember the moves, but they don't understand their purpose; the ideas behind these moves. Last, but not least, annotations help you find the beauty behind chess moves. Behind complete games. When you are merely going through the moves, you might consider them easy to find. You might think there is nothing special behind them. When an annotator shows you the depth of variations, when he explains the thought process behind the decision-making, you realize everything is not so easy. You start to appreciate the mental strength and creativity of great chess players. You enjoy the games much more. Compare it to visiting an art gallery. When you visit an exhibition, you may not understand all the details or fully appreciate why a certain painting or sculpture is better than the others. But when you hire a guide who explains the technique, the details, and the context, you realize the nuances. Then we immerse in the beauty of art much easier. HOW to Study Annotated Chess Games? Study annotated chess games by playing over them without a board. The first and the most obvious method is to play over the annotated games. When you go over the game, you should stop at critical moments and read the author's insight, in order to understand better what's happening on the board. Initially, you will probably need a chess board and a chess set. While moving the pieces, you can follow the annotations and variations more easily. With time, as your chess strength increases, you might develop a habit of going over annotated games (e.g. reading chess books) without the use of the board. It is not only a much faster method, but you also practice your board visualization and memory. Guess the move when you play over annotated games. The drawback of simply playing over a game is 'brain automation'. For best results, you have to think on your own. Guess the move is an excellent technique to force you think on your own. When you are going over an annotated game, you can place a piece of paper over the text and try to guess the move that was played. After removing the paper, you can see what the player actually played and find out how your move and idea compare to the text. Everybody knows that solving tactical puzzles is a great way of improving your calculation and tactical awareness. What most people don't know is the method we are going to propose here. Method of exercising your calculations on the basis of annotated games. When you are going over a game, you stop at a critical moment of the game, usually a complicated position. You then take time and try to calculate the possibilities without moving the pieces – just like in a real game. Afterward, you are able to compare your calculations with the annotations and see where you went awry. The aforementioned method was a hobby-horse of the famous chess trainer, Mark Dvoretsky. His fantastic book, "Analytical Manual", is full of examples from real games, in which the reader should calculate various possibilities and find the best move. Some positions are so complicated, that he proposed the reader to take at least one hour for the task. The ability to maintain concentration and disciplined thinking for an extended period required for solving the exercise. The ability clearly to picture, and where possible, accurately to evaluate the high volume of positions arising in the course of our analysis." Another favorite method of Dvoretsky that is similar to an extent to the previous one. When you go over the game, you once again stop in the critical position. However, instead of calculating without moving the pieces, you play an actual training game, starting from the given position. This method is very good because it simulates the tournament conditions. The drawback is, of course, the need for a training partner whose strength is approximately similar to yours. Now, we have to mention you may also try to guess the move, calculate from a certain position or play training games on the basis of games without annotations. However, when the game is annotated, you will not only see that a player played differently. You will also understand why he did so. WHICH Annotated Chess Games to Study? Now that we have explained the whys and hows of studying annotated chess games, only one question remains open – which annotated games to study? In the 21st century, a hyperproduction of chess content is happening. Books, videos, courses, databases, lectures, etc., are booming all over the Internet. New collections of annotated chess games are being written as we speak. It is very hard for an inexperienced player, but also a more experienced one, to navigate his way through this dense forest. To decide which annotated games are worth studying. Classics are often quite clear and simple. World Champions often faced weaker opponents, who allowed them to carry out their strategical plans unhindered. In contrast, modern games are much more complicated. Modern chess is much more concrete and it is often hard to understand what is happening without thorough analysis. Trying to study them first is like trying to run before you learn how to walk. Classics were often annotated by World Champions themselves – which is a guarantee of quality. „Without a serious study of the chess classics it is not possible to become a proper chess player, just as it is impossible to imagine, say, a writer or poet who has not read Shakespeare, or an artist who has never seen Rembrandt's paintings. Thus, studying classics annotations is vital for the development of a chess player and for improving your game. In the final paragraph, we will mention a couple of books and game collections of chess classics that, in our opinion, are well worth your time. A famous game collection by the great American. Noteworthy because he includes a couple of his own losses. The annotations are of the highest quality and very objective. Tal was not only an entertaining player, but also a very talented and witty writer. Throughout this book, you will enjoy both on-the-board events and the stories behind. Alexander Alekhine was often cited by Kasparov, but also by Fischer as a player who has had the greatest influence on their own playing style. And indeed, Alekhine is known for his "difficult", dynamic chess, which made his games incredibly interesting and attractive. Similarly as with Fischer's My 60 Memorable Games, the big plus for My Best Games of Chess is the absence of computer-generated analysis. The reading of the book "flows" and the number of diagrams makes it easy to follow the "human variations" given by Alekhine. Irving Chernev was not an outstandingly strong player, but he was an outstanding chess writer. In these books, he adopts the move-by-move approach – he guides the reader through a number of famous games with simple and clear annotations after every move. This approach is especially valuable for beginners. David Bronstein was the World Championship challenger in 1951. In this historic book, he takes us through the Candidates Tournament in 1953. He annotates every single game played in this dramatic event. Last, but not least, Kasparov's epochal series, devoted to entire chess history. The reason we have put it in the last place is its complexity – it is definitely not suited for beginners. But we firmly believe every chess player should read these books at least once in his life.